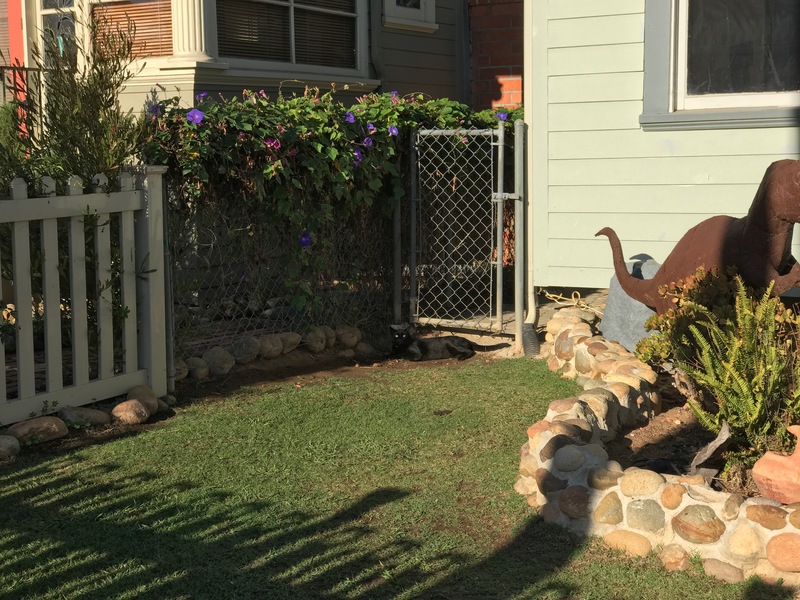 Neighborhood tortoise Morla shares residence with four other animals: Pair of dogs and cats. 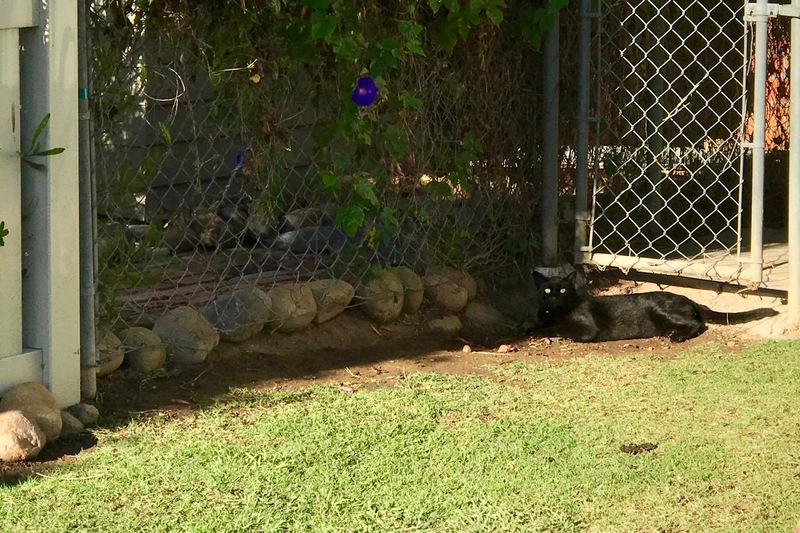 She has a little house at the end of the driveway, while the the black, whose name I don’t know, moves between the front and backyards. On Nov. 4, 2016, I spotted the feline, as she intently watched birds. Presumably the mammal tolerates the reptile—hence today’s title. I used iPhone 7 Plus second lens to zoom 2X for both photos. My expectations, with distance to her and head in the shade, were low. But bright green eyes piecing from the shadows make the shot. I present a second, to demonstrate two different characteristics of Apple pic processing. The Featured Image, captured at 9 a.m. PDT, is a 100-percent crop, auto-enhanced in Apple Photos. The second, shot three seconds earlier, is an in-camera HDR composite that’s a little dark for my tastes but reveals more detail. Vitals for the Featured Image: f/2.8, ISO 20, 1/647 sec, 6.6mm. The other is same except for shutter speed: 1/791 sec. Yes, that’s a dinosaur to the right. The landscaping has nearly as much character as the resident animals. Other felines featured in this series: Scruffy, Roly Poly, Woo, Skull, Biscuit, The Colonel, White, Chipper, Frisky, Stretch, Needy, Farfisa, Mates, Hunter, Pee-Pee, Blue, Blue Too, Bonded Pair, Patience, Fess, and Jumper.